Sometimes all it takes is a little cloud layer to hide the background stars to really reveal how bright Jupiter is right now. 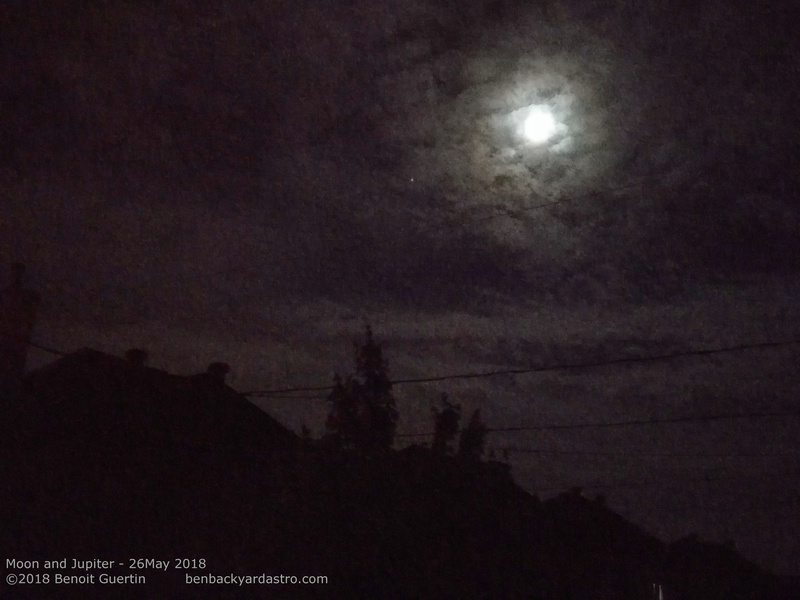 The photo below was taken with my smartphone on May 26th, with Jupiter clearly visible next to the Moon. Jupiter and Earth were at their closest (opposition) on May 8th, but the entire month of May is a good time to spot Jupiter as it’s up high in the sky most of the night. Once Venus sets in the early evening, Jupiter is the brightest “star” in the sky, a good 20 times brighter than the next brightest stars. Up until May 28th, Jupiter and the Moon will be near each other in the night sky, making for good photo opportunity. We don’t often look “straight up”. Unless you are laying down, it’s not a comfortable viewing position. However there is lots to see and the Big Dipper (Ursa Major) is right overhead this time of year. Setting up a camera with a 10 second exposure can capture quite a good deal of the sky, and you don’t have to worry too much about star trails. What stands out is the large variations in the colors of stars, from cooler deep reds, to hot bright blues. Constellations right above in the May evening. 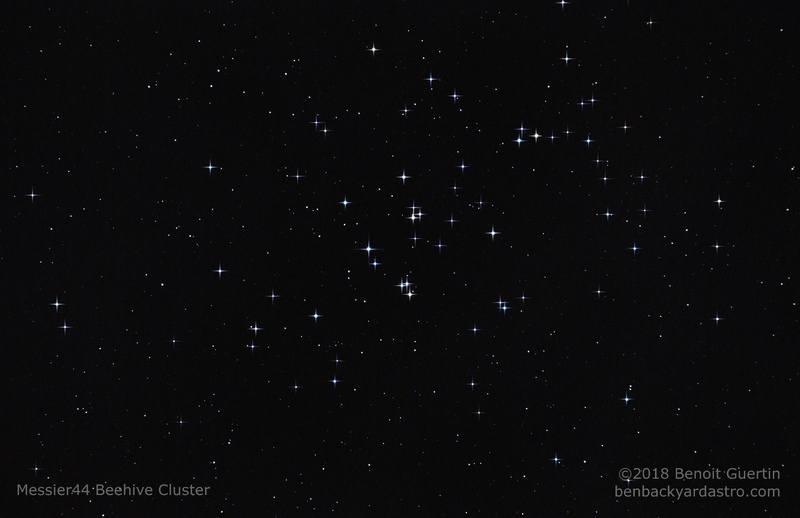 In one of my previous post I mentioned how Messier 44, the Beehive Cluster, would be an easy find the evening of April 22-23, so even if I took this photo on the 21st, the same evening that I took a photo of the Moon, all I needed was to moved a few degrees north after observing the Mooon to image this large open cluster. Photos of open clusters with small refractors always lack the diffraction spikes that really make the stars stand out. So a little photo editing did the trick to spice up the image. 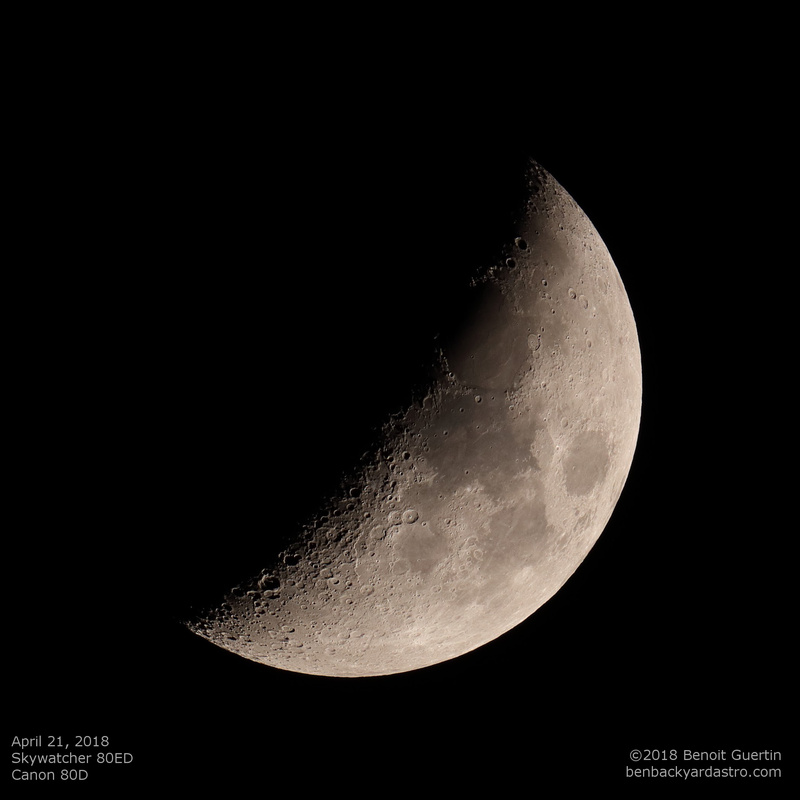 The Moon should be the first thing you look at the day you get to peer through a telescope. It should also be the first thing you photograph. However don’t wait for a Full Moon. Sure a large round moon over the horizon can be breathtaking, but most of the subtle details of the lunar surface disappear under a Full Moon. The lack of shadows blends away the peaks and valleys, crevasses and ridges. It is really this dance of light and shadows that makes the craters stand out. Click on the image below for full resolution. After a weeks of clouds, rain and even snow, I finally get a sunny weekend without a cloud in the sky. With the warmer temperatures, time to take the telescope out. 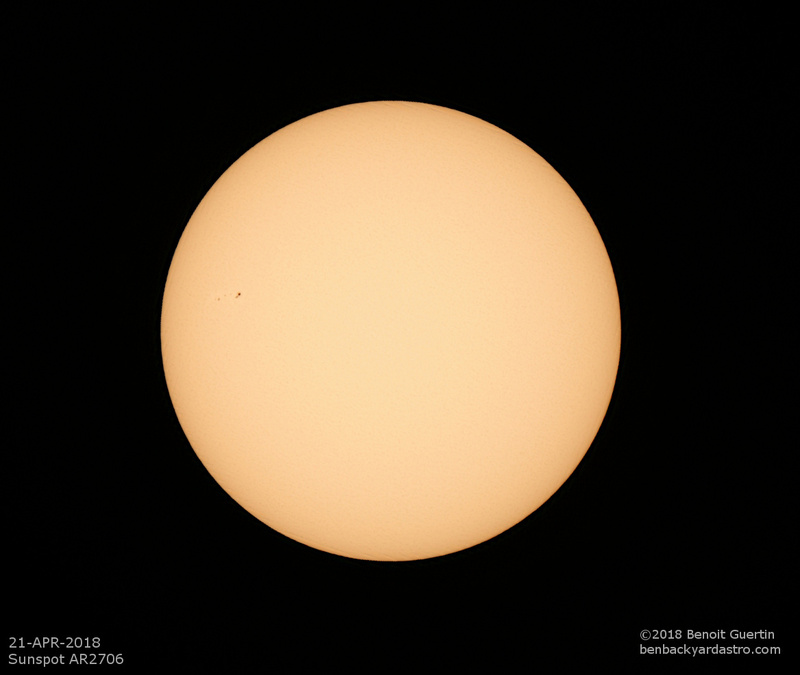 Unfortunately no significant sunspot happening on April 21. Just a small region (AR2706) on the western part of the sun. The Beehive cluster, also known as Messier 44 (M44) is one of the nearest open clusters, and therefore one of the largest in the night sky. While open clusters are often too dim to be seen with the naked eye, all you need is a pair of binoculars or a camera with long exposure to see it. What makes this weekend special is that in the night of the 22nd to 23rd of April, the Moon will pass within 1-1/2 degrees of this cluster. So finding it will be child’s play. On April 22nd, simply look for the Moon once the sky is dark, and just above it you will find the Beehive cluster with its 1000+ stars. OK, even with a telescope you won’t be able to see all the stars, but take some time to notice how this group of stars stands out with regards to background stars further away in our galaxy. And while you are at it, consider that nearly 410 years ago, Galileo made the first observation of these stars. From there you can also hop over a to the west and observe the color difference in bright stars Castor and Pollux in the Constellation Gemini. 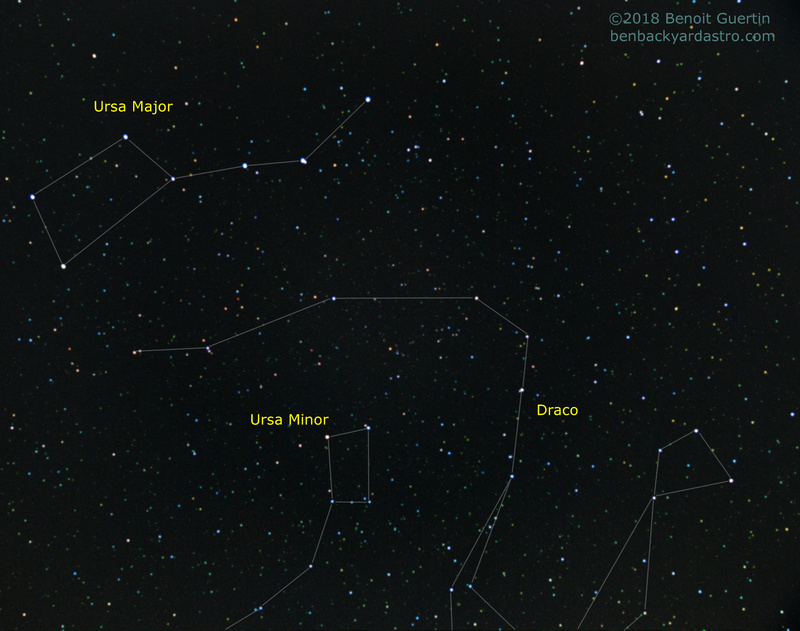 And if you instead decide to go east, the smaller Messier 67 open cluster is also accessible with binoculars.